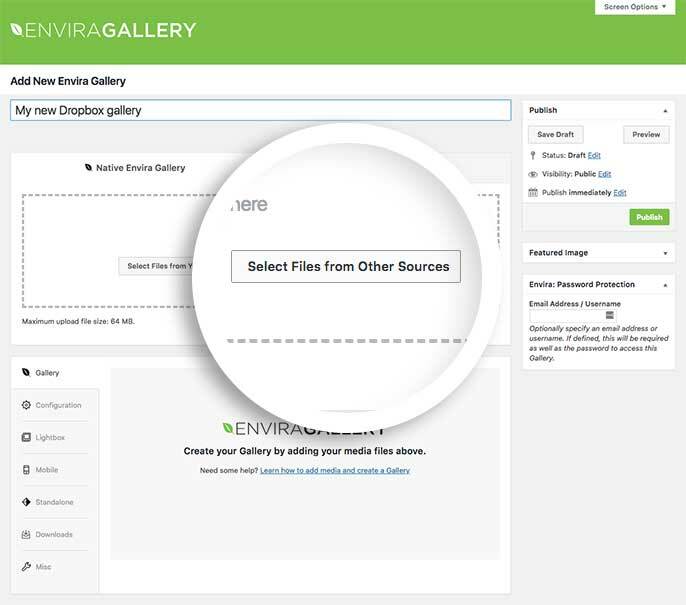 Are you an avid user of Dropbox and want to connect Envira Gallery with your Dropbox images? The Dropbox Importer Addon for Envira Gallery connects to two perfectly. This doc details how you can import images from your Dropbox account, straight in to your Envira Galleries. What kind of permissions does Envira require when connecting with my Dropbox account? Can I auto-populate a gallery from a folder in my Dropbox account instead of manually adding images? Why are my Dropbox directories taking so long to load or not loading at all? Why can’t I see some of the image thumbnails? Can I download large image files? Will I be able to import mp4 files? In this instance, you’ll be activating the Envira Dropbox Importer Addon. Once the addon is activated, you’ll need to get a code from Dropbox that give Envira permission to import your Dropbox images. 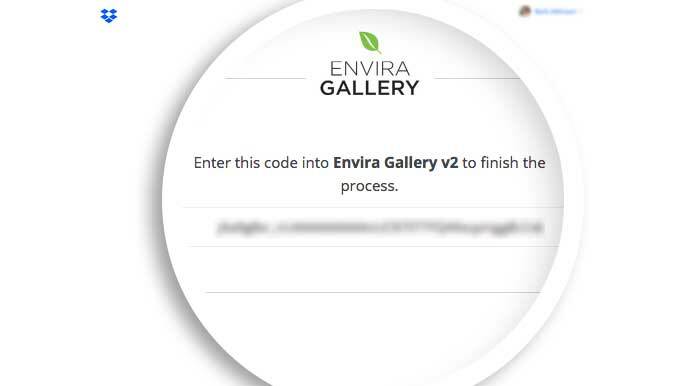 Navigate to the WordPress Admin » Envira Gallery » Settings page. Then select the Dropbox tab. On this screen you’ll want to click the Get Code button. A new browser window will open directing you to the next step. On this screen, Dropbox is asking if you’d like to give Envira permission to use your Dropbox images. Click the Allow button. When you click Allow, you’ll be given a code. Copy this code as you’ll need it for the next step. Now that you’ve copied your code, head back to WordPress Admin » Envira Gallery » Settings » Dropbox tab and paste the code into the Code field. Then click the Save Code button. You’ll see a success message letting you know that your Dropbox account is now linked. Should you ever need to unlink it, just click the Unlink Dropbox Account button. You can also enable to show your image thumbnails or just the file icons by checking the box for Show Thumbnails. Enabling to Show Thumbnails may cause slowness when loading larger Dropbox folders. If you click the Show Thumbnails option, remember to also click the Save Settings button to save the changes. You can now create your first gallery using your Dropbox images. To begin, create a new gallery or edit an existing one. You can follow along with our documentation for creating your first gallery. Next, click the Select Files from Other Image Sources button. A pop up window will open and you’ll be able to select the Insert from Dropbox link on the left sidebar to view available files and directories. Just select the images you want to use in your gallery and click the Insert Into Gallery button. Your Dropbox images will be inserted into your gallery but also imported into your Media Library to be used on any post, page or widget area. Continue the set up for the gallery by running through the other tabs and configuring your gallery options. A Dropbox gallery will look like any other gallery you’ve created with Envira, the only difference is how the images were imported. Would you like to customize some of the styling on the gallery images you’ve just imported? Take a look at our tutorial on How to use Black & White Filter for Envira Gallery Images. Q: What kind of permissions does Envira require when connecting with my Dropbox account? A: Envira Dropbox Importer requires that you grant Envira read only access to all images in your Dropbox account. Q: Can I auto-populate a gallery from a folder in my Dropbox account instead of manually adding images? A: No, Envira Dropbox Importer only allows you to import images from Dropbox into WordPress Media Library. Q: Why are my Dropbox directories taking so long to load or not loading at all? A: There are several ways to improve the successful and quick browsing of your directories. 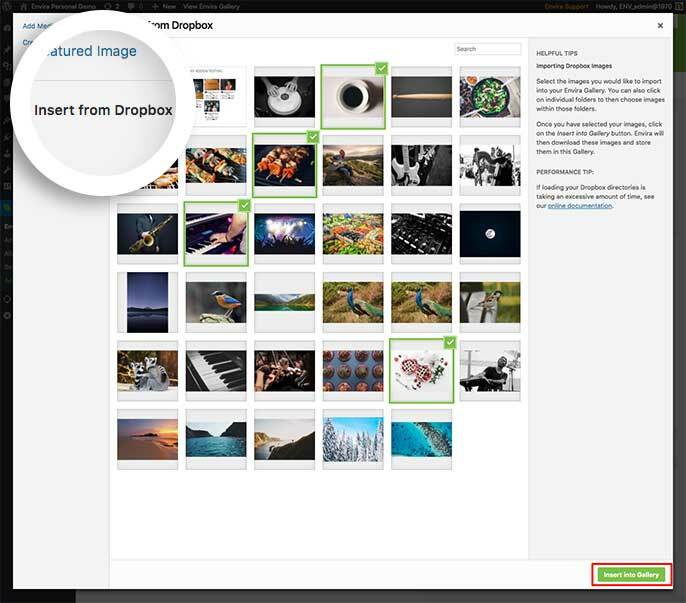 Navigate to the Envira Gallery » Settings » Dropbox tab and make sure that the option for showing thumbnails is unchecked. While it’s nice to see a preview of the image, in large galleries, this can cause issues in performance. If a directory has a large number of images, it will also significantly slow the process. You may want to consider reorganizing your images into separate folders in Dropbox. 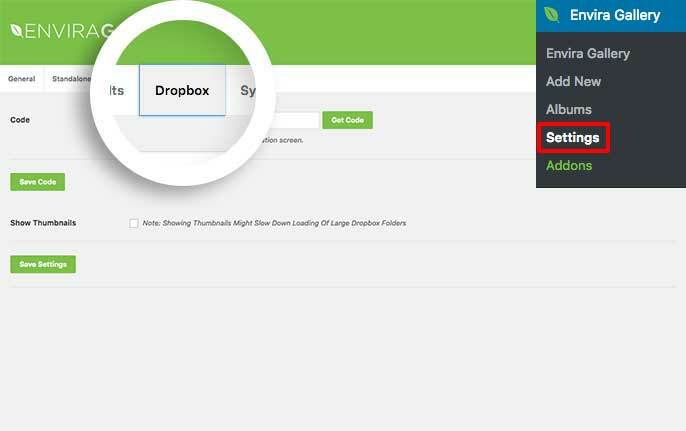 This will allow Envira Dropbox Addon to work more quickly for your convenience. If the above doesn’t resolve the issue, check to make sure that you do not have a large image file (100MB+) in the directory that you are viewing. Q: Why can’t I see some of the image thumbnails? A: This is most likely a large image file. Dropbox doesn’t allow thumbnails of images over 20MB in size. Q: Can I download large image files? Before adding this, check with your host about any memory restrictions that they may have. Q: Will I be able to import mp4 files? A: No. The Dropbox Importer Addon can only import image files (png, jpg, jpeg, gif) at this time. Updated: Uses new Dropbox v2 API. Note: must re-connect with Dropbox API. Added: Option to turn on/off thumbnails.